I can’t tell you how much I’ve been craving baking. It’s a slight odd sensation, but I just haven’t been able to stop thinking about donning my apron and getting my hands covered in flour. I think it is the horrific weather outside that’s doing it. These bars are to help counter act this. 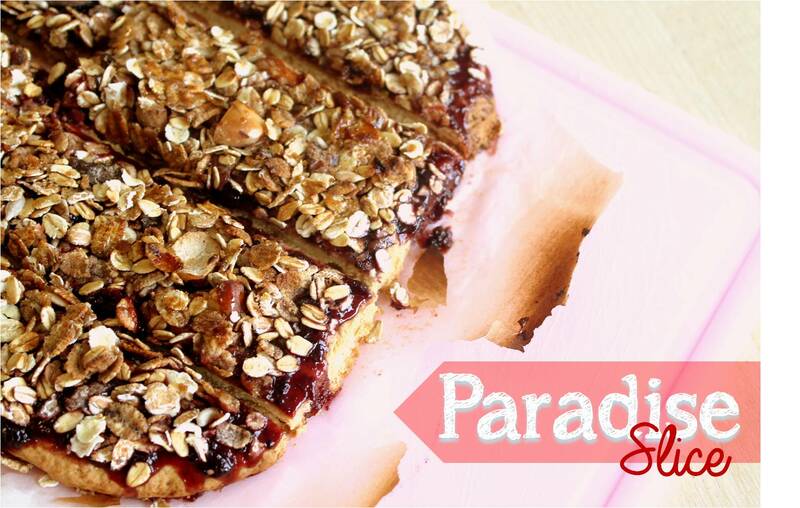 While not hot and warming like you’d expect on a cold day, I get instead a fruity summery burst to help me dream of lazy August days, hence the name paradise slice. First stir the flour and both sugars together in a bowl. Then add the butter and rub together until a breadcrumb texture is formed. Then start to kneed into dough until thick and fully combined. Line a shallow tin with grease proof paper, and press the dough into the tin, until covered and firm. Then pick the surface with a fork. Bake in a pre-heated oven at 180c for 20 minutes until golden brown. Once baked, allow to cool fully- around another 20 minutes. Once cooled spread the jam all over the shortbread, giving a thick even coverage. Next sprinkle over the muesli and press lightly into the jam. Drizzle over some maple syrup in a zig zag motion, and finely sprinkle a little brown sugar. Under a moderate grill, allow to toast until the sugar starts to caramelise and the oats turn slightly toasty. Once cool again, slice and serve. Be warned, these are seriously morish, I may have already devoured 3 today. There is something about sweet, fruity jam that I just can’t resist. It’s the same with scones and cream, another summer delight- oh gosh, bring me summer soon please! By the way, I added a little heading to the first picture- yes or no?